What the **** kind of keyboard do you use that you managed to get a 'c' into death? When you can spell death I will take you seriously. Is deatch like beatch? A really low class version of a death? Someone not worthy of full death? Obama is a sick, disgusting individual who should be sectioned under the mental health act. Lots of people say he is the anti christ, and after his behaviour and general demeanor over the past few days, i'm more & more inclined to believe them! Obama creeps me out. Like some kind of demon or something. Please don't vote this degenerate back into office! You sir are possibly the most enlightened individual i have ever come accross on TSR. I mean literally.. that is all you need to say, and it sums OP's up. Deep. If he gets any bounce at all it's going to be extremely short lived. Edit: Also, for the record, what would filling the coffin with pork achieve aside from inciting the Islamic world against the US? The dead should be treated with respect (note; not honored) regardless of who it is. Also, for the record, what would filling the coffin with pork achieve aside from inciting the Islamic world against the US? The dead should be treated with respect (note; not honored) regardless of who it is. Was Nick Berg or Daniel Pearl treated with respect? How about those people falling to their death from the twin towers, were they treated with respect? Terrorists aren't going to have a better opinion of us one way or another. Maybe if they knew they would be buried in a barrel of pig's blood when captured, they would stop committing acts of terrorism against us. I'm not justifying those actions, but once those people were dead, their bodies weren't desecrated. In any case, whatever happened to maintaining the moral high ground? Trust me, it doesn't make sense to us either. If he wants to be secure his presidential seat, he better pass the dream act or produce jobs left and right before 2012. This whole Osama-affair may be great and almighty now, but the effect probably won't last. 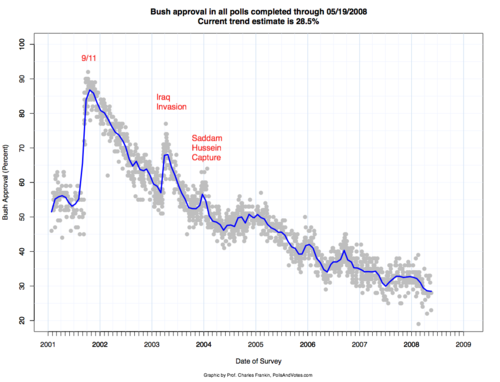 Some argue that Bush had more to do with it than Obama. Although I'd choose Obama any day over Trump (he may be an interesting business man and funny TV personality, but president of United States, no way!). However, Palin is the worst, if she became president it would just be plain scary. He will win now.The Main attack against him was he was weak,unpatriotic and even a terrorist.No one can him those things.He has also secured a face saving exit from Afghanistan. No one can him those things.He has also secured a face saving exit from Afghanistan. They're not exiting from Afghanistan. Speeches from John Kerry and Hilary Clinton over the past couple of days confirm it. I agree, they should have taken Osama back to the US so Obama could have shot him personally on TV. I bet that would have been great for ratings. You know nothing about US politics if you think the above - the albatross around his neck is the economy, period. Despite killing OBL for example, his ratings have slid further on the issue, to the lowest point on record. I have no doubt that the economy shall improve by the time we reach 2012, but if it doesn't, that shall be the end of Obama. All killing OBL will do is give Obama a short-term boost and at best, shore-up his commander-in-chief credentials somewhat, but then this was never the main issue to begin with - amongst those who count, the independent voters. As the old adage goes, "It's the economy stupid".